People who have a negative experience with their military service are usually those who did very little research prior to joining. Many in this category are either looking for a job - any job - or let the recruiter recommend certain jobs that the military needs at the time. Regardless, you should have an interest in where you go, what you do, and how you serve this country as military service is not just a job, it is an honorable profession that can be exciting and rewarding if you know what you want to do. This knowledge takes time to research. 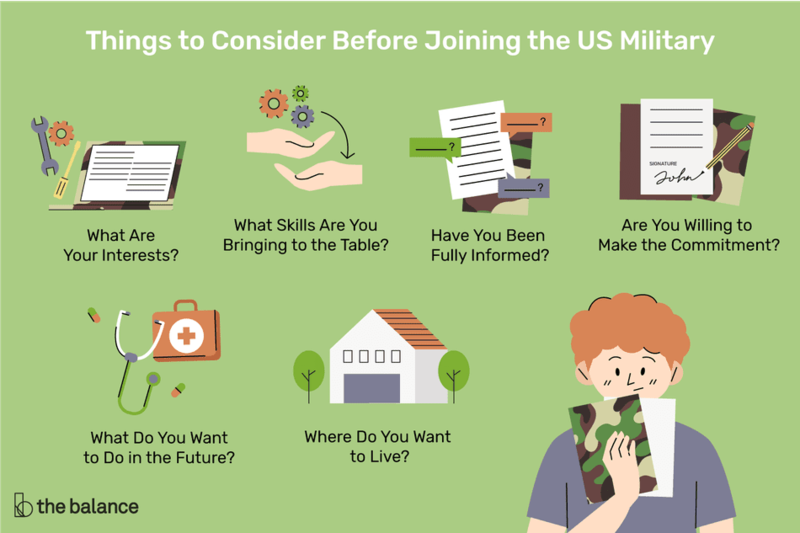 To ensure that you are making the right decision for yourself and your country, there are a few things you should consider before enlisting. Joining the military will provide you with specialized training in any number of fields, depending upon the branch you are considering. Think about what skills you would like to possess at the end of your term of service. Learn as much as you can about each branch of military service and see which one will suit your needs. This way, you can serve your country to the best degree possible. US Military 101 and Choosing a Military Service may help you decide which branch is the best for you. What Skills Are You Bringing to the Table? If you are already proficient with certain skills, perhaps you would like to hone these skills in the military. Whether it is working with computers, mechanics, or administrative duties, the military can provide you with the best training in a wide variety of areas. See Military Enlisted Jobs for an overview of the 800-plus enlisted jobs available in the military. If there is an interest, it is likely the military has a job for you. You can be anything in between a weapons expert to a language expert and even a military IT guy. Many people are enchanted with the idea of the military, only to have “buyer’s remorse” after joining. Seriously contemplate whether or not you will be happy with the commitment you are going to make. Once you have enlisted, you are under contract with the US government, and getting out is no easy feat. It is extremely important. You must ask all of the right questions before enlisting. Make sure you do the appropriate research and talk with as many people as possible. This way, you won’t feel misled or cheated when the actuality of your situation becomes evident. Don’t listen selectively; actively listen to your recruiter. Make a list of things you need to know about and get informed. The article, What the Recruiter Never Told You can help make you an informed player. After being in the military for a while, some decide that they would like to make a career out of military life. Others decide that they would like to move on and pursue their education or a career in the civilian world with the skills they picked up while serving. Have your future in mind when selecting a job when you enlist. Make sure that you will leave the service with the proper tools to be successful in life. The Job Selection article will help you understand how the services make enlisted job selections. Look at the locations of the different services bases around the United States and around the world. There are some beautiful locations these bases are located - and some not so nice.